2. My church book group has been reading about Buddhism and this seems very closely connected. 3. I love wandering and I never do it. Well. Almost never. When we repeat the same activities day in and day out, we limit our ability to have new experiences. Over time our bodies, senses, and brains start to atrophy. Our world becomes smaller and smaller until we are living in a tiny little box. The above is in a section called "The Importance of Randomness." Which I love. I've had the best experiences with randomness. Most that immediately come to mind are, of course, bookish in nature. This book emphasizes that wandering can take many forms, and one of the ones that resonated the most with me, as I'm sure it would with anyone who's seeking out a book blog, is "Library Wandering." Have you tried library wandering? She gives a list of "Ways to Subvert Your Browsing," which I'm going to try the next time I go, but in terms of basic, no-frills library wandering -- have you done it? I've found the most tremendous books by doing this, and they all feel especially special because they were found at random. I have absolutely no goal. I wasn't even particularly looking to check out a book; I just found a section I thought looked interesting and I started browsing. I found Old Mr Flood this way. I found 50 Works of English Literature We Could Do Without. And just last week, I found The California Gold Rush and the Coming of the Civil War, which I am LOVING. Different people will respond to different elements of The Wander Society. There are lists, there are diagrams, there are poems, there are assignments. They all encourage you towards a common goal: to let go, start wandering in your daily life, and see what happens. 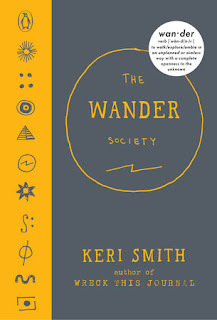 Penguin is offering a giveaway copy of The Wander Society, so if you'd like to be entered, leave a comment and I'll pick someone on Monday. IT'S A SUPER-CUTE BOOK. US readers only, but international people, don't think I love you any less.